Basement: Yes, Crawl "patial finished"
Size: 2,688 sq. 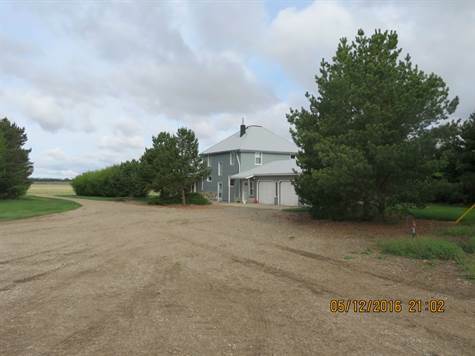 ft. "on 2 levels"
Year Built: 1927 "renovated 1996"
Excellent acreage only 20 minutes out of Rosetown, - 4 miles grid then 12 miles pavement. Yard has natural gas, well and lots of gravel. Beautifully landscaped with good shelterbelt. Livestock facilities with livestock waterer. Shop is lined with metal and heated with natural gas heater. It has water and bathroom facility. There is a 2013 pole frame machine shed plus converted hip roof barn for cold storage or livestock. The house is 2688 sq.ft with heated attached garage. New high efficiency furnace in 2014. Septic system is a seepage system. Master bedroom-4 piece ensuite; main floor bath-2 piece; 2nd floor bath-4 piece.